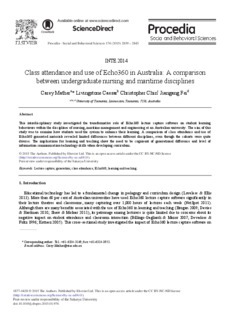 This interdisciplinary study investigated the transformative role of Echo360 lecture capture software on student learning behaviours within the disciplines of nursing, maritime management and engineering at an Australian university. The aim of this study was to examine how students used the system to enhance their learning. A comparison of class attendance and use of Echo360 generated materials revealed limited differences between different disciplines, even though the cohorts were quite diverse. The implications for learning and teaching show the need to be cognisant of generational difference and level of information communication technology skills when developing curriculum.